This time of year is often, for me, a time of reflection. Like many others, I try to both take some time to review the year that is now nearly past, and articulate intentions and hopes for the year about to begin. One of my personal goals in 2018 has been to speak out, loudly and as often as necessary, to protect my religion, Scientology, and my family and friends who join me in that faith. It’s become pretty clear to me that there are a few people, including some influential ones, who would love nothing more than to take away my freedom to practice my religion. And that, I think, is dangerous not just to me and mine, but to every well-intentioned person on earth. There are many “hot” political issues right now—issues that divide us, issues that have no easy answers, and issues that I won’t bring into this holiday blog. It’s pretty obvious that the “people of earth” are a diverse, unruly bunch, and we don’t always find it easy to agree. But I do think there is something that we can agree on and that is this: freedom is a good thing. You and I want the freedom to think our own thoughts, make our own life choices, believe in our own faiths. We want to be free to have children or not; to love whom we choose; to live without fear. In the United States, we pride ourselves on our commitment to freedom. We teach our children about the founding families who came to these shores from Europe hoping to escape tyrants who refused to allow them the freedom to practice their own faiths. The rebels who started this country were determined to fight for the liberties they considered vital to their survival: the freedom to choose their own thoughts, livelihoods, lives and beliefs—to speak their own minds and follow their own moral codes. They fought for freedom—and then worked to agree on exactly what that meant. Their compromises became our history. For some, freedom for themselves was the goal—but not freedom for all. Not, for example, African slaves. Or women. Or native Americans. It seems to me that the dark times from our history came not from an excessive devotion to freedom, but from the opposite: from an inability to understand that unless there is freedom for all of us, none of us are truly free. And so, like the American Founding Fathers, each of the excluded groups has had to fight for their freedom—demand it, protect it, and, once achieved, pass it on to their children. The fight for freedom is far from over for many of us, both here and across the globe. 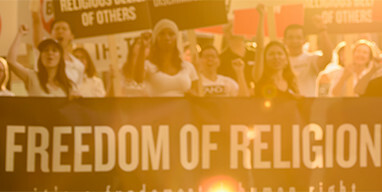 As I fight today for my rights to think and worship according to my own conscience, without oppression from governments or anti-religious groups, I am reminded that this is a fight that has been waged by religious groups for thousands of years, and that nearly every one of them has been met with derision and oppression. Today, I am permitted to practice my religion in my country, but like others who practice a minority faith, I am expected to be quiet in the face of hate, turn the other cheek to slurs and catcalls and ignore the bigoted falsities proclaimed by the mainstream media. I’ll tell you right now that in 2019, I don’t intend to follow those “permitted” guidelines. I intend to continue to fight for freedom—true freedom, and not just for myself, but for you too, and all of us. And if you are someone who would deny freedom to others, know this: I won’t be quiet, and I won’t turn away. I will look you in the eye, and I will identify you to the world as the anti-freedom, anti-religious bigot that you are. I will demand, protect, and pass on my freedom to my children, and to their children. And in the next year and all the years to come, I hope that you will do the same.